Some people react rather harshly to threats, and often find themselves trying to appear stronger in response. For others threats are something they don’t take all that seriously, and would rather just ignore that type of behavior. 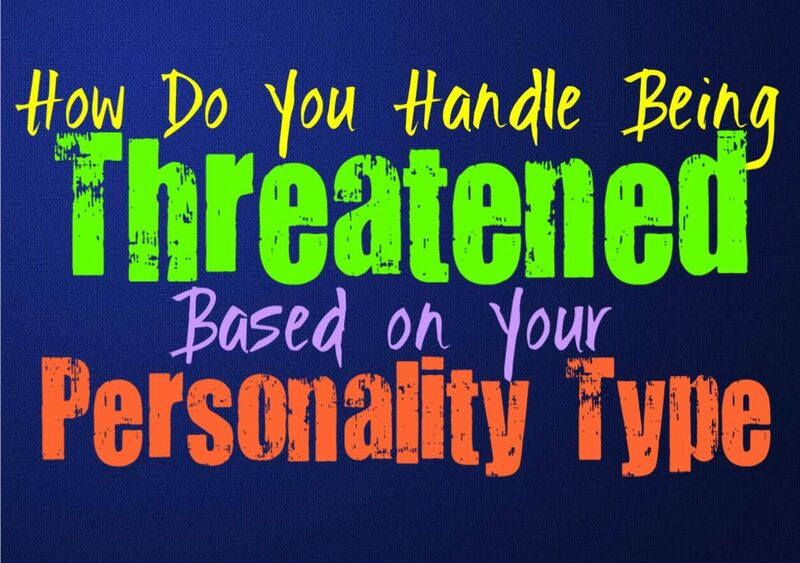 Everyone responds differently, and here is how you respond to threats based on your personality type. INFJs often become very uncomfortable with threats of any kind, but especially ones of the physical nature. They become uncomfortable when someone tries to threaten them, especially since they aren’t often connected to their physical presence all that much. For INFJs having someone come at them this way, often needs some sort of response or defense. They dislike this type of behavior most of the time and prefer to be around people who don’t threaten others and try to act like they are superior to them. ENFJs definitely don’t appreciate threats, and often become uneasy by them. Most of the time they try to combat threats by taking action, or finding ways to shut this person down. ENFJs are very diplomatic people who often know exactly what to say and do in order to avoid certain situations. If someone is coming at them in a negative way, they will do their best to simmer the situation, and if that doesn’t work they are not afraid of taking action. ENFJs simply try to be more strategic in their ways of getting someone’s threats to become invalid. INFPs certainly don’t appreciate being threatened by someone, especially when it is an obvious threat. When someone comes at them in this way they might try to ignore it, in order to make the situation calm down a bit. INFPs don’t often like to challenge others and usually prefer to keep some sort of peace. If they are around someone who continues to bully everyone and make threats, INFPs often do reach a breaking point which surprises most people. They aren’t afraid of shutting that person down or finding ways to make them look like a fool. ENFPs really don’t respond well to being threatened and often find it easier to just take on the challenge right away. If someone tries to threaten the ENFP they will either pass it off as meaningless and foolish, or will make sure to shut that person down completely. ENFPs would rather not give the control to someone else or make it appear like they are afraid simply because someone threatens them. INTJs are often deeply uncomfortable with threats, especially the physical kind. They aren’t all that connected to the physical world and become uneasy when someone tries to challenge them. They are likely to use their minds to strategize a way to shut this person down and prevent them from following through or making any further threats. INTJs don’t just ignore when someone threatens them in hopes it will go away, they instead try to find out the smartest way to stop this person. For ENTJs having someone threaten them means they need to make a stand and protect what is theirs. They don’t like feeling like they are being challenged, and will be unlikely to just ignore this. When the ENTJ receives any kind of threat, they want to find the smartest way to shut this person down and keep them from trying this again. Sometimes this means making an immediate stand and so the ENTJ won’t be afraid to show their internal strength around someone who threatens them. INTPs often try to logically assess the situation when someone threatens them, instead of being emotional and worked up about it. If a person makes a threat they try to decide whether or not that individual is actually someone they should fear. INTPs want to approach these things with a logical thought process instead of just letting themselves get worked up over someone who really is just making idle and foolish threats. Most of the time when the ENTP is threatened they pass this off as amusing and something they really aren’t afraid of. They don’t like playing into what someone else wants, and in most cases the threats have little to back them up. ENTPs can recognize how to shut someone down or make them feel stupid for coming at them in this way. They can often use their minds as a means of plotting against someone, but sometimes they are good at doing it right away by simply ignoring the person. ISTJs can become uneasy when they are threatened, mostly because they take the things in their lives very seriously. They want to protect what is theirs and so when someone tries to threaten that they become very defensive. ISTJs can be strong-willed people, especially when someone is coming at them in a negative way. They aren’t afraid of making a stand, but at the same time they want to do this intelligently and think it through beforehand. ESTJs are very strong-willed and sometimes intense people, and so if someone threatens or challenges them they are likely to respond immediately. ESTJs will show their strength and make it apparent that they won’t take kindly to any threats. Even when things are a bit heated, ESTJs aren’t going to just let someone threaten them, and so they will make sure to shut this person down and let them know they aren’t afraid. ISFJs often try to avoid negativity and discord, and so they don’t like when someone makes threats towards them. At first they are likely to try and simmer the situation down, in hopes of making things better. They don’t like dealing with disagreements or someone disturbing the peace in their environment. If this person continues to make threats ISFJs are simply likely to cut them out and find a way of completely removing them from their lives. ESFJs become truly angered when someone threatens them, mostly because they uphold a certain level of responsibility for their loved ones. They want to provide for those around them and so this means they want to avoid allowing anyone to damage this. ESFJs also strive for a sense of harmony and so when someone threatens this they become very defensive of it. They might try and calm the situation at first, but in the end they will try to remove this person from their lives if they make threats towards them. ISTPs rarely find themselves all that upset or bothered by threats, and can easily ignore them. They aren’t usually shaken by someone making threats towards them, especially since they find that they can often be idle. ISTPs would rather focus on doing their own thing and don’t like letting other people get to them. When someone makes a threat it can often be easy for them to ignore, unless they continue to press the matter and then the ISTP will have to take the challenge. ESTPs aren’t often afraid of threats, especially if they have loved ones by their side. They don’t like backing down from someone who threatens them and can be rather strong-willed people. ESTPs can be rather intense people and they don’t like acting afraid of nervous, especially in front of their loved ones. They might become nervous by certain people but they rarely let this show around others. ISFPs actually can become nervous about certain threats, but they often turn to their friends and loved ones for defense and support. ISFPs are good at finding people who will stand by them and even protect them from unkind people. For the ISFP being threatened is something they really become uncomfortable with, since they would rather live more positive and peaceful lives. ESFPs are very connected to the physical world around them, and they can be protective of what they have. They do often take threats seriously though and will try to respond accordingly. If someone tries not threaten or attack them in some way, the ESFP won’t simply back down but they might seek the help and defense of their loved ones. ESFPs simply operate better with the people they love around them, and this helps them feel more confident.